Our local church held an event recently where they asked brides who had been married in the church and who still had their dress if they would lend them for an exhibition. The invitations led to a superb display of 90 dresses from the 1950s to the present day. Those who no longer had their dress were invited to submit a photograph. There were plenty of those because so often when all the other trappings and reminders of the day have been lost or thrown away the photographs survive. 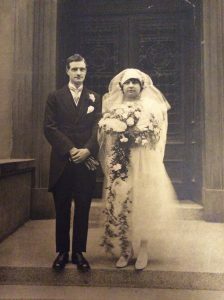 Which reminded me that I had recently come across the wedding photographs of my parents and my maternal grandparents, and got me thinking about their marriages and the changes in the way marriages have been conducted in Scotland over the past nearly 100 years. I don’t know much about my grandparent’s (Archie and Mary) wedding in 1923 but in the photograph they both stand stiff and unsmiling. Grandpa is wearing a formal morning suit with very shiny shoes (perhaps a reminder that it was only a few years since he had left the army after serving in World War 1) and he is clutching his gloves and hat in front of him, while my grandmother shows off her enormous, trailing bouquet and elaborate headdress. The wind must have been blowing while the photo was taken because her dress is blurred making it difficult to tell exactly what it looked like. They were married by a minister, not in a church but a hotel. In Scotland at that time, ministers & priests were the only people who could conduct what were known as “regular” marriages – though not necessarily in a church. As the name suggests there were “irregular” marriages in Scotland too, which until the law changed in 1940, were legal. A couple could choose to declare they were married in front of two witnesses (hence these marriages are recorded as “by declaration” rather than “after Banns” or “after Proclamation”) and then pay a “fine” to have their marriage registered and confirmed by a sheriff or sheriff substitute. 30 years later, my parents (Dan and Winnie) are shown smiling – I always thought they look so happy in their photograph – as they walked away from the church. They look much more relaxed with Dad holding Mum’s hand in the crook of his arm. 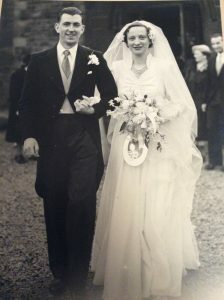 Dad is wearing a morning suit, but there is no evidence of the gloves and hat of his father-in-law and Mum’s headdress is of a similar style but not so elaborate as her mother’s – and a much smaller bouquet. She always claimed her flowers were red, but because the photos were in black and white you can’t tell. Their marriage took place in church and was conducted by the minister, after their Banns had been called. At the time they got married, “irregular” marriages had become illegal. But by then it wasn’t just ministers who could conduct the ceremony. Since 1939 people could by married by a registrar in a civil ceremony, though only in a registrar’s office. In 2002 the law was changed to allow marriage ceremonies to be held (almost) anywhere that the local authority is willing to allow – though still conducted by ministers & priests or registrars. It wasn’t until 2005 that the list of celebrants was expanded to include, for example, humanists.